I’ve been thinking a lot about the attraction of the memoir. This year’s Wordstock (rebranded as the Portland Book Festival) a couple weekends ago gave testimony again to our culture’s currently heightened obsession with this genre. There were endless sessions it seemed with writers talking about their latest memoir or autobiographical work of fiction. We are a people who need to tell our stories, and we need them to be heard. So, I began thinking about why our culture has been feeling so egocentric lately. But then I realized that a memoir, a really good one that is actually doing its job well, while it may be about the author, sure, is probably not so much for the author as much as it is for the readers. 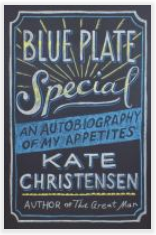 Kate Christensen’s Blue Plate Special, in this way, probably carries more significance for some of its audience members than even for Christensen herself (which, I understand, sounds ludicrous since the book is after all about Christensen’s very personal experiences). What I’m talking about is the power of relatability. When a reader reads about an author’s experiences that mirror that reader’s own experiences, this means that reader is suddenly not alone anymore in their experiences. I deeply feel that some of the topics Christensen’s book addresses (such as domestic violence, relational infidelity, and childhood molestation) are the ones that so often need the voice of solidarity. The book uses the author’s endless love of food, flavors, and cooking to find touchstones amongst the harsher topics that the author deals with throughout the story. I loved the imagination of the recipes at the end of many of the chapters. They felt like exemplifications of personal victories in the realm of self-actualization.